I may not have mentioned it before, but I like free stuff. So much so that I once walked all around the downtown core of Vancouver with Kalev acquiring free Slurpees. And then the next year, free Slurpee-acquiring day went on a trip to the ‘burbs. And then last year, despite Kalev’s absence, I managed to snag myself a couple of freebies. This year, however, I am Slurpee-less. You see, this year free Slurpee Day (7/11) fell on a workday and where I work, there are NO 7/11s. Seriously, I work in giant 7/11-less chasm (see Exhibit A). 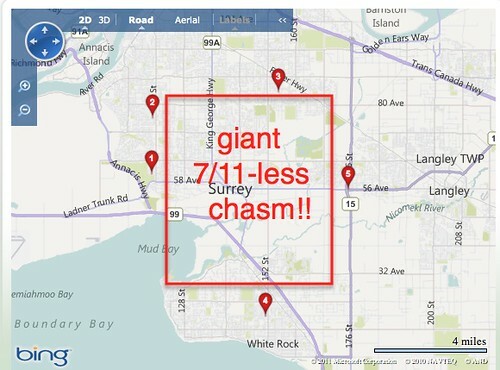 Exhibit A: A Giant 7/11-less chasm located around my place of employment. That meant my 1/2 birthday this year – yes, my half birthday just so happens to fall on 7/11 day – was devoid of Slurpees (see Exhibits B and C). 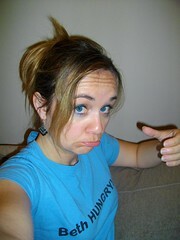 Exhibit B: Sad Slurpee-less Beth is sad and Slurpee-less. Notice the lack of Slurpee in her hand. 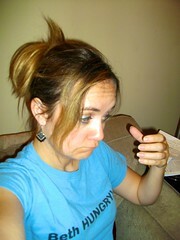 Exhibit C: Sad Slurpee-less Beth looks sadly at her Slurpee-free hand. Instead of free Slurpees, however, I had a dentist appointment. I had somehow realized that the dentist forgot to book me an appointment1 – I’m supposed to go every 3 months instead of 6 months because I have braces – and when I contacted them, it turned out that they just so happened to have a cancellation this evening and if I didn’t take it, I wouldn’t get one for several weeks since they were closing down for the dentist’s vacation, and then my schedule would be all screwed up. So it was off to the dentist I went after work. Of course, that meant I didn’t get home until late and now I’ve not been able to get nearly as much done as I’d intended this evening and I’m super tired and need to go into work early tomorrow, so I really need to get to bed ASAP. In other news, I made a crawesome dinner2 of green rice and bean burritos, both of which I made extra jalapeño-y, so the day wasn’t a total loss.